If you live in a large city, such as Milan you have to face a serious problem of automotive congestion in the downtown areas. Many people in Milan use a bicycle to solve the problem: to go for a ride or to get to work. It is easier to go by bike in Milan and you will not get stuck in traffic. If you want to taste Milan by bike, you can rent a bike or discover the bike sharing service. Rent a bike with "Noleggio biciclette AWS"
The bike sharing service offers citizens and tourists low-cost access to bicycles within the city to ease traffic congestion, curb pollution and boost physical activity. 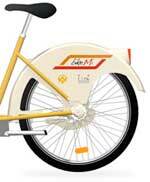 Bike sharing operates on a self-serve model (no attendants) and is geared toward short-term uses. Bikes can be returned at any station (see the map where you can see available bikes in real time). Do you want to visit Milan by walk? Here some Walking Tours to discover Milan by day and evening or live a special afternoon in the fashion capital of Europe as a photographer! Bring your camera and join this photography walking tour for an afternoon in the fashion capital of Europe - Milan discovering its past and present. You will learn simple techniques to improve your architectural photos, portraits and streets shots. See Piazza del Duomo, Royal Palace, Piazza Mercanti, Via Dante, Sforzesco castle, Sempione park, Brera Quarter, Piazza della Scala, Galleria Vittorio Emanuele II.